Hayward Baker wins 2012 ASCE® Project of the Year Award from the American Society of Civil Engineers – Ridge Branch for their work on “East-West Connector” project which involved extending Edgewood Boulevard to the west, from Harden Boulevard to South Florida Avenue. 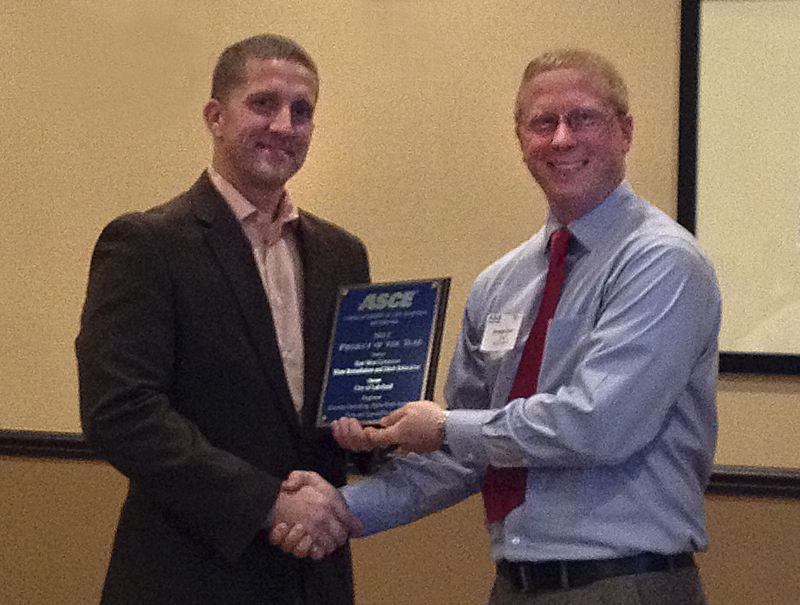 Hayward Baker Inc., North America’s leading geotechnical contractor, has received the 2012 Project of the Year Award from the Ridge Branch of the American Society of Civil Engineers (ASCE). The award, given for a highly innovative slime remediation project, was presented to Ed J. Garbin, Jr., Ph.D., P.E., chief engineer of Hayward Baker’s southern region, on February 23, 2012 during the ASCE Ridge Branch’s annual awards banquet in Lakeland, Fla. 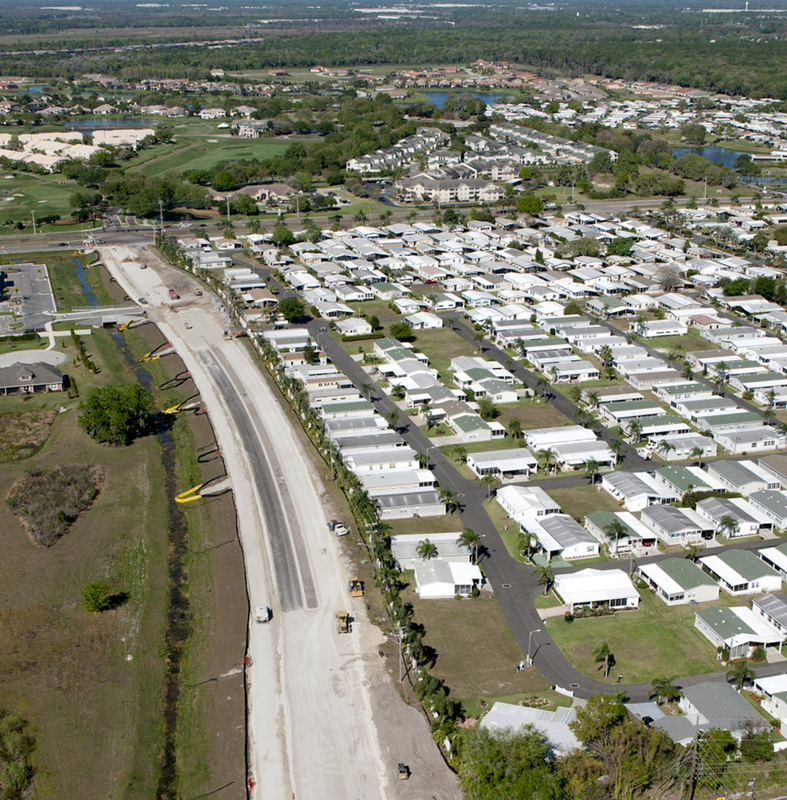 In being selected for the award, Hayward Baker was cited for its technical leadership in employing highly effective and cost-efficient Rigid Inclusions (RI) technology in the construction of a major road extension in Lakeland, Fla. The “East-West Connector” project involved extending Edgewood Boulevard to the west, from Harden Boulevard to South Florida Avenue. The project’s scope included constructing a new roadway embankment through an area formerly strip-mined for phosphate ore. A portion of the proposed roadway alignment was situated over settling ponds remaining from the former mining operation. These ponds contained up to 40 feet of very soft waste phosphatic clay (slime). This very weak and unstable material needed to be modified in order to make the land suitable to support the roadway embankment. Hayward Baker’s solution was an innovative Rigid Inclusion (RI) ground improvement system, proposed as the most effective and cost-efficient way to ensure long-term stability in an environment of poor soils beneath the new roadway embankment. As a proven solution in Europe for supporting embankments on soft soils, RIs reinforce buried soft compressible soils by transferring stresses from a near-surface granular soil to a deeper competent stratum. Compared to alternative stabilization methods, they are often a significantly less costly solution. Employing RI technology for ground improvement involves using high modulus columns constructed through compressible soils to reduce settlement and increase bearing capacity. These are arranged in a grid pattern and extended to the competent bearing stratum. As part of the system, Hayward Baker designed a reinforced earth bridging layer directly atop the grid of RI elements to ensure uniform stress distribution to all elements. Kimmins Contracting Corporation constructed this geosynthetic-reinforced, compacted aggregate platform. Arching within this layer distributed all overburden stresses to the RI elements. The work began in October, 2010 and was completed within five months’ time. Due to thorough pre-planning and the RI design calculations conducted by Hayward Baker, the project proceeded smoothly according to plan, with no unforeseen developments or project delays encountered. Kimmins Contracting Corporation served as the primary contractor on the East-West Connector project. In addition to Hayward Baker, other project participants included Atkins North America for engineering consulting, and Tierra, Inc. for geotechnical/materials testing and environmental consulting. Established in 1852, the American Society of Civil Engineers (http://www.asce.org) is America’s oldest national engineering society. It represents more than 40,000 members of the civil engineering profession. The society’s mission is to “provide essential value to ASCE members and partners, advance civil engineering, and serve the public good.” ASCE members hold a bachelor’s or higher degree from an accredited civil engineering program, are licensed professional engineers or have a minimum of five years’ responsible charge of engineering experience. The Geo-Institute was established in 1996 and is one of ASCE’s eight institutes. Its members include scientists, engineers, technologists and organizations interested in improving the environment, mitigating natural hazards and economically constructing engineered facilities. Its award programs offer members the opportunity to be recognized for their contribution to the profession. Hayward Baker Inc. (http://www.haywardbaker.com) is North America’s leader in geotechnical construction. Ranked by ENR magazine as the #1 Excavation/Foundation Contractor, Hayward Baker is the industry leader in applying ground modification technologies to site improvement and remedial work, with a 60-year record of experience. A wide range of technologies is employed in providing foundation support and rehabilitation services as well as settlement control, structural support, site improvement, soil and slope stabilization, underpinning, excavation shoring, earth retention, seismic stabilization, and ground water control. Hayward Baker is capable of offering full Design-Build services for virtually any geotechnical construction application. Ed Garbin, Jr., Ph.D., P.E.